Comet Industries 1190 Series DRIVEN, 1" Shaft, 9.84" Diameter. Secondary pulley for UTV’s and Ride-on Trowels (Allen: 1200-SHD). 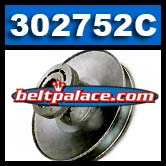 Replaces 042282 Allen/Walker Miller ride on trowel driven (secondary) pulley clutch (e.g. Pro 1200C, 1200SHD). 302752-C. Fits 1” Shaft, 9.84" diameter, Brown Coil Spring, Requires 1-7/16” (1.44”) top width Comet CVT belt. Comet/Allen/Walker Miller Part 302752c (# 042282). Comet 1190 Series Secondary Pulley: 1” Bore, for UTV’s and Concrete Trowels. Use ONLY with Comet Industries Symmetric 1-7/16” Wide torque converter belts! Comet 300656 (A-C) Drive Belt. Comet Industries 300656-704086 Belt. Comet 300670 (A-C) Drive Belt. Comet Industries 300670-704133 BELT.